A to Z Motor Spares (Wakefield). 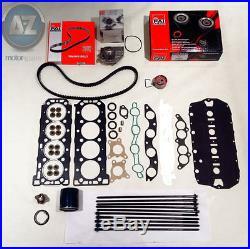 MG Rover MLS head gasket bolts timing kit water pump thermostat filter OEM. BEFORE YOU READ ANY FURTHER PLEASE NOTE THIS KIT CONTAINS THE. 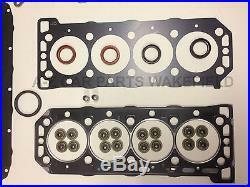 1 X OEM QUALITY UPRATED HIGH PERFORMANCE HEAD GASKET SET. 1 X OEM QUALITY UPRATED HIGH PERFORMANCE HEAD BOLTS SET. 1X OEM QUALITY OIL FILTER. 1 X FAI TIMING BELT WITH AUTOMATIC TENSIONER. 1 X FAI WATER PUMP WITH GASKET. 1 X OEM QUALITY THERMOSTAT. LOOK AT THE IMAGE AS ALL THE CONTENTS ARE OF ACTUAL ITEM. UK CUSTOMERS PLEASE DON'T FORGET TO LEAVE YOUR VEHICLE REGISTRATION NUMBER. NOT TO BE COMPARED WITH ANYTHING ELSE AS WE ARE THE FIRST TO BRING YOU THIS REVOLUTIONARY ENGINE REBUILD SYSTEM. SPECIFICALLY DESIGNED TO HANDLE HIGHER COMPRESSION RATIOS , SPECIAL CAM TIMING AND HIGHER OPERATING TEMPERATURES AND IN ADDITION THEY ARE IDEAL FOR ENGINES THAT USE SUPER CHARGERS , TURBO AND NITRO-OXIDE. THIS BOX KIT CONTAINS HEAD SET - INCLUDES MILD STEAL HEAD GASKET AND HEAD SAVER ON SOME HEAD BOLTS - 12.9 HARDNESS , THE HIGHEST SPECIFICATION AVAILABLE OIL SEALS AND VALVE STEM SEALS - THE OIL SEALS ARE MANUFACTURED FROM VITON RUBBER , THE OE STANDARD THERMAL SPEC. TECHNICAL DATA AND FITTING INSTRUCTIONS INCLUDED. BEFORE PURCHASING WE RECOMMEND CONTACTING US WITH YOUR REG NUMBER SO WE CAN CHECK FITMENT. THIS WILL AVOID ANY DISAPPOINTMENT OF RECIEVING INCORRECT PARTS. We make every effort to deliver goods within the estimated timescale. However delays are occasionally inevitable due to unforeseen circumstances. We recommend you do not book your vehicle in for any repairs until you physically have the part to save on any disappointment caused by delays. Azcarparts Wakefield will be under no liability for any costs on damages or expenses caused by any delays. The item "MG Rover MLS head gasket bolts timing kit water pump thermostat filter OEM" is in sale since Sunday, April 13, 2014. This item is in the category "Vehicle Parts & Accessories\Car Parts\Engines & Engine Parts\Gaskets & Seals". The seller is "atozwakefield" and is located in Wakefield. This item can be shipped to United Kingdom, Austria, Belgium, Bulgaria, Croatia, Cyprus, Czech republic, Denmark, Estonia, Finland, France, Germany, Greece, Hungary, Ireland, Italy, Latvia, Lithuania, Luxembourg, Malta, Netherlands, Poland, Portugal, Romania, Slovakia, Slovenia, Spain, Sweden, Australia, United States, Russian federation, Canada, Brazil, Japan, Israel, Hong Kong, Norway, Indonesia, Malaysia, Mexico, Singapore, South Korea, Switzerland, Taiwan, Thailand, Chile.